As of the time I began to write this post; there are now 46 wonderful entries to view and be inspired by, with only a day left to enter those last minute projects. I can't believe how fast the time has gone, here in Missouri I think we skipped autumn and went straight to winter! it has gotten so cold so fast and the leaves are just now starting to change. This month we had a lot of really great handmade fall decor, and I cant wait to try some of them! Here are 3 of the latest entries that really caught my eye. These Cute Pine cone owls are just the cutest! 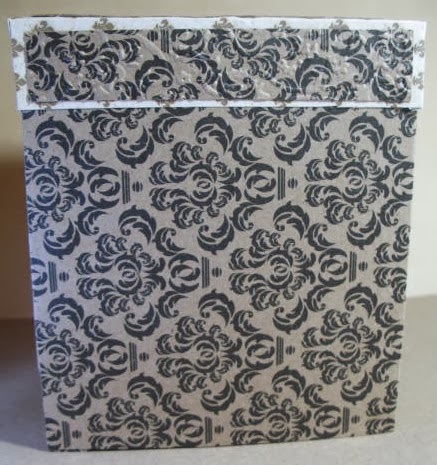 And this Classy Elegant card was made by Heather! The challenge will close in approximately 28 hours at midnight PST, and the winner will be announced November 2nd, so good luck and have a great weekend! Creative Play is our sponsor, so hop on over and visit them. 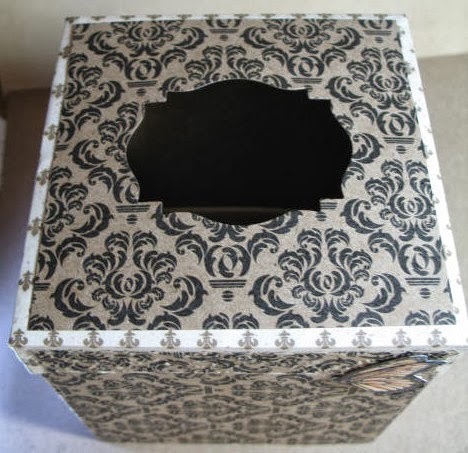 I was checking out Pinterest and came across a tissue box cover, not just an ordinary tissue box cover, but a GORGEOUS tissue box cover here. I followed the link to this website, called Paper Cookies. Delightful name, eh?. She's done a tutorial that is so easy to follow and so easy to do, that you will want to make one too. 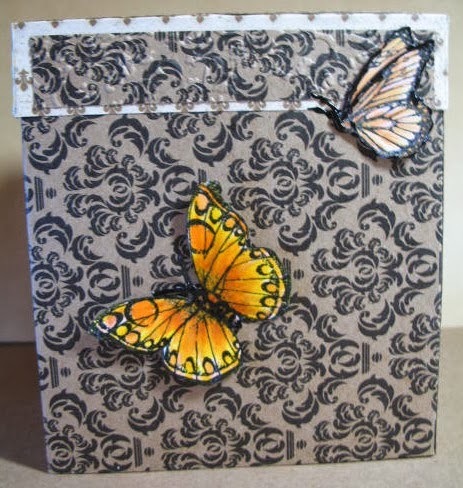 You can also see the written tutorial at Split Coast Stampers here. You really do need to visit Diane Zechman's blog. This is the top and I forgot to emboss it, oh well, only I will know... well, you too, and I know you won't tell. Undecorated side, which looks pretty darn good. The top strip is embossed with a similar design as the cardstock. 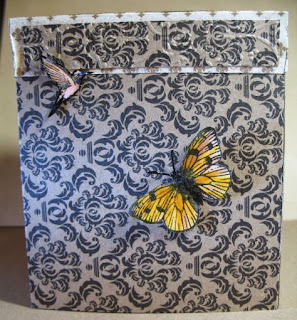 I decorated two of the sides and cut out the Hero Arts butterflies & bird from Antique Engravings (CL383), still one of my favorite stamp sets, ever. I am very pleased with my tissue box cover. Two sides are left clean. The color of the box in this photo is not the true color of the box. The previous photos show the true colors. I wanted to get a better photo of the box so you could see exactly how pretty it is. I hope you enjoyed this and try one too. Why Google you ask, when you can find plenty in our very own flickr group? Well I have more online accounts then I can count and rather then signing up to view and save images I like to just be able to type it in, and I like to look beyond just another card, I like to find inspiration from, paintings or drawings, and photographs or just looking around at decorations in windows and shops. So when I think of a theme or something similar I just put a short description in the google image search box and press enter, and within seconds lots of fun and interesting things pop up to inspire me. In-fact this is how my idea for this months challenge came about! So if you are interested, copy the following into the search box or click on the links, and be inspired! I went to a Stenciling class on October 2nd and this is what I accomplished, with expert help form our teacher at The Stamp Art Shoppe. I used the same stencil, but they look totally different, don't they? This is a new Dreamweaver Stencil "Oak Leaves" and we got to play with it on different textures. All cards are dry embossed. The first card: The top rough panel was stippled with different ink colors, then Translucent Embossing Paste was applied with the stencil still in place. The Oak Leaves stencil was removed and glitter was sprinkled onto the wet paste and the panel was left to dry. The dried panel was attached to the dry embossed brick panel which was quite glossy and had Memory Box pads applied directly to the panel, then wiped off. 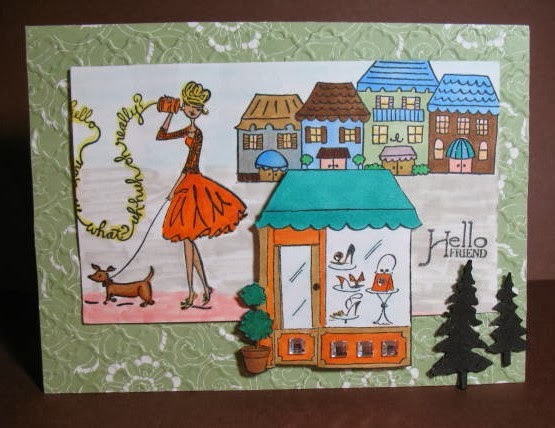 Some ribbon and a greeting completed this card. I'm very happy with it. Mirror paper was stenciled and many colors of Distressed Stickles was applied with the Oak Leaves stencil in place. The mirror panel was attached to a dry embossed silvery panel and that panel then adhered to a dark green note card. This pre-embossed white panel was used to dry emboss the Oak Leaves on a light table. 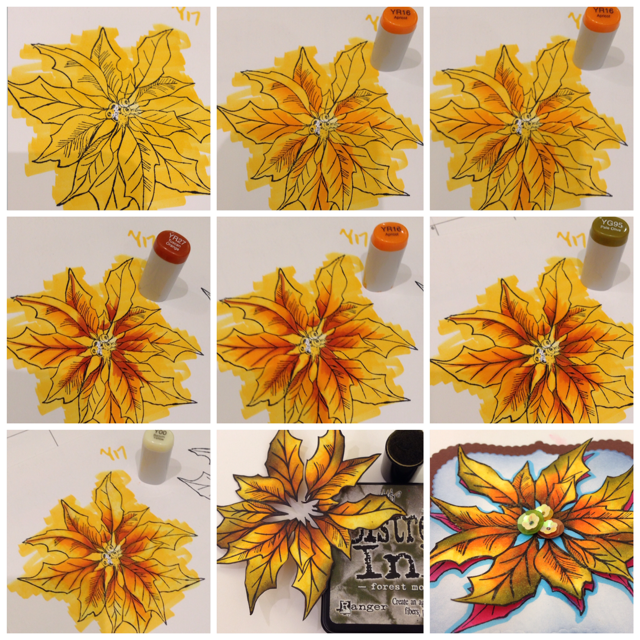 With the stencil in place, the image was painted with a stipple brush dabbed in Fall colors. 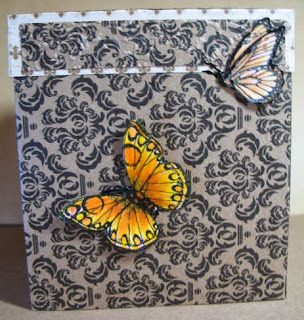 I then put the card together and adhered the Heart Winged Butterfly I had stamped and embossed in white and stippled with distress inks..
You can find inks, distress Stickles, and stamps at our sponsor, Creative Play. October Coming to a close? No Problem! there is still plenty of time to enter your card/projectsby clicking the link above this post or go HERE till October 31st at midnight PST. 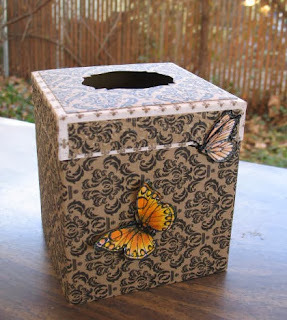 Just remember all projects must be made after October 1st and have at least one die cut or embossing folder. You can enter up to 4 times. 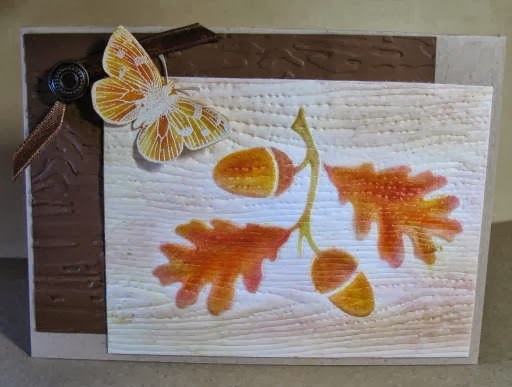 This Months Theme is Animals and Autumn, which means you can enter a project, using an animal and/or autumn stamp, die, or embellishment, the choice is yours! 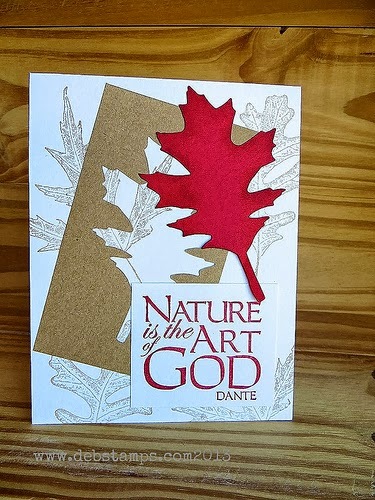 Still not in the mood for autumn cards, or do you just need an idea? One of my favorite things to do is to decorate the house with each season, especially fall! and these candles are a very simple yet elegant. 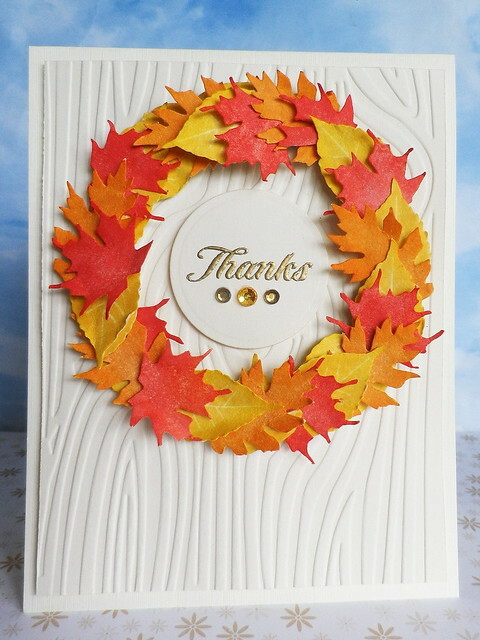 Created by Silke: visit her blog for more cute fall decor idea's. This Card is clean and simple, but it just seems Majestic to me! the colors are subtle but it all just pops out at you. Isn't this such a Cute Card! 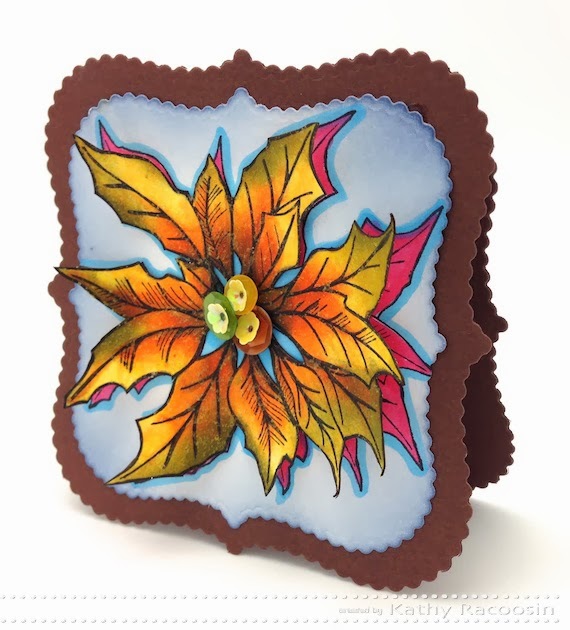 I'm always looking for idea's making shaped cards and this is perfect! It has been such a fun week with Kathy, and I'm sad to see it end, but before she goes our DT want to thank her for such a lovely time and such Beautiful cards! 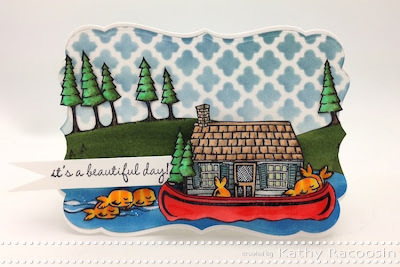 Picking a favorite can be quite difficult when it comes to choosing one of Kathy's creations, and I mean that in a good way, all her work is just beautiful! But this particular card really popped out at me. This reminds me of when you go to the store looking at faux flowers and say to yourself " it looks so real! 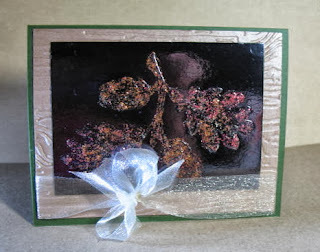 "(which can occur occasionally, but not often) I mean does this card look handmade to you! This is what hallmark is supposed to be able to do! the details and vibrant coloring put me in awe, of what you can do with paper, stamps, and markers. You can really tell all the work she put into this card. One of my favorites from The Daily Marker is in June of this year. Kathy uses her dies and patterns in unusual ways which have a "WOW" factor. She can put together patterns and colors to create a masterpiece. This presentation calls to me. Kathy strives for perfection and meets the challenge every time! 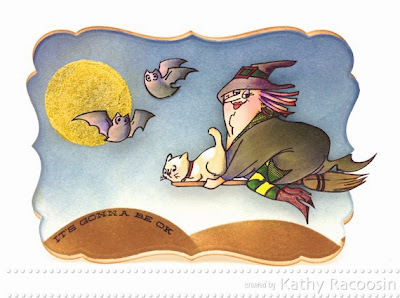 This card of Kathy's was done in November 2012. You can see the amazing tutorial on her blog post HERE. The roses are so realistic looking and I just love the way she distressed the background. The centre seems to glow. As usual Kathy has added all the delightful extra such as the banner and buttons, stitching and Spellbinders edging. When Hannah asked us to choose our favourite card from Kathy's blog I knew that it would be a very hard pick for me. 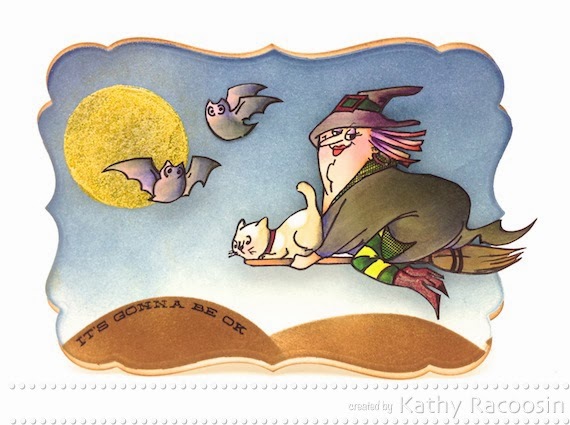 I see so many gorgeous cards on Kathy's blog that I wanted to pick them all. Truly Kathy is an amazing artist. I just love the way she creates scenes with such amazing detail, like she has on this card. Please stop by her blog & check out all of her other amazing creations. Kathy! Thank You So Much for joining us, is was such an honor to have you as our guest, your work is so amazing and inspiring. We loved having you. Come back to see more of Kathy's lovely work? Today she has a Copic coloring technique to share with you! Photo 5. Add more highlights in the cracks areas with YG95. Photo 6. Lighten the tips of the petals with Y00. Photo 7. Distress the tips of the leaves & cut out. Photo 8. Stamp image again. Color pink, add bling to the center. And the result...... This Lovely card! Thanks Kathy, the card is Beautiful! Your shading technique was very helpful, now I just need to buy more copics! If you missed Kathy's Intro Yesterday click here and visit her blog, she always has great idea's and coloring techniques to share. And be sure to stop back by Friday to see our DT's Top Picks of Kathy's Projects, and to thank Kathy for a Great Week! Lets get to know, Kathy Racoosin!!!! Since I was young I was searching for the perfect creative outlet. My friend was on a trip and she learned how to emboss. 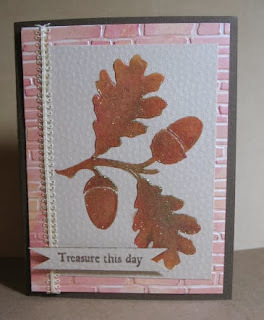 When she shared with me the magic of embossing I was hooked immediately! I finally found what I had been looking for all those years. 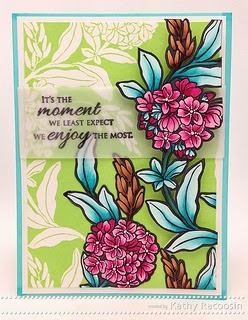 Rubber stamping and coloring the images with markers. I believe I started in 2008 and blogging in 2009. I’m really into stencils now i feel like they are the new background stamp. easy to store and you can do more with them. I wish I could create more simple designs but, I get too carried away and don't know when to stop. 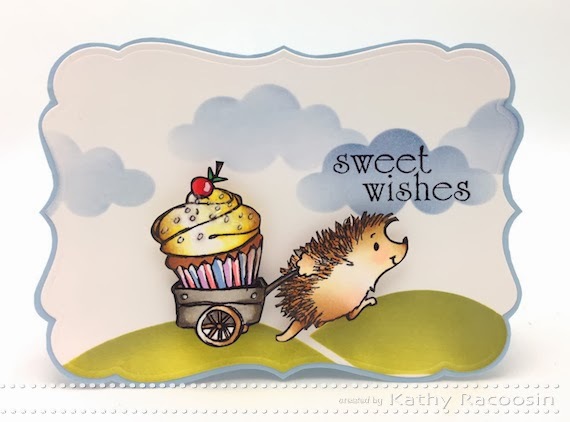 I have designed for the teams of Simon Says Stamp, Penny Black, Basic Grey, Two Peas in a Bucket & SRM Stickers, to name a few and I have guest designed for the Online Card Classes, as well as Purple Onion Designs. Now that you have finished reading about Kathy...Have a look at her fantastic work below. and please visit her blog and leave her some comments here as well, she would love to have you. Thank’s Kathy it was great getting to know you! 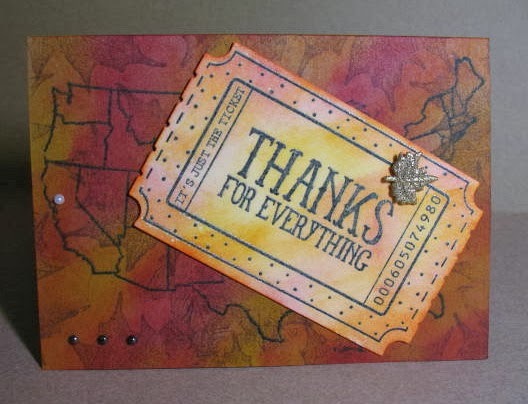 Your cards are indeed very colorful and that is what I love about your style, all your cards and projects are so vibrant! If you want to see more of Kathy come back Wednesday and Friday, I can’t wait to show you! I have to say that I'm loving all the entries so far in Hannah's challenge. You all rock! I'm hoping to comment on all your creations before the end of the month. That's if my laptop doesn't have any more death wishes & dies lol. Today I thought I'd share a card that I made with you all. 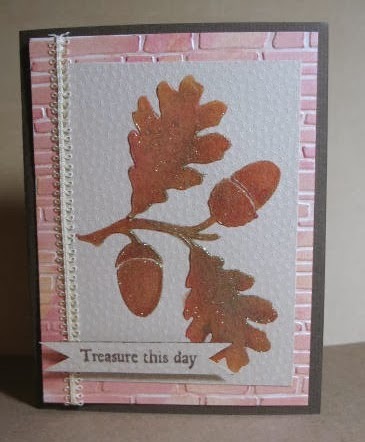 I used an animal & stamped some leaves on the background (can't see them that well) in what I think are Autumn tones, Crushed Olive, Wild Honey & Rusty Hinge Distress inks. I kept it fairly simple as I really wanted the owl to stand out. I can see this card being used for a heap of different uses. and added the horse die. just pop open with a little pull. It fits individual candy packets just right. I also colored this with distress inks and added the ghost die on top. I just used pattern paper and some ribbon. and it's just like the peppermint wrappers. the hang of it it's fairly easy to do. Hope you enjoyed and get a chance to make one, they are great all year round for Birthday's Parties, Holidays, and so on. I think we all have those moments where we are on a time schedule, and what happens? we run out of adhesive and there is no time to get another! So what can you do when that occurs? As I was preparing for this month's posts that very thing happened to me, and there wasn't time to run to the store and buy more adhesive, my projects had to be ready. 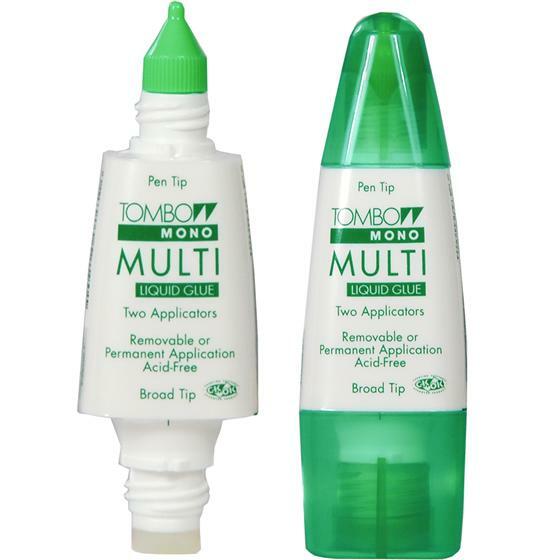 My only option was to use glue which I wasn't to happy about, but it had to be done, so I went to my craft drawer to find an alternative when I remembered about my Tombo Mono Multi Liquid Glue. It's the perfect solution is a pinch, though it does take about 15 minutes or so to dry, depending on the amount you use. and the "broad tip" for larger area's, this acts like a glue stick. As you gently squeeze the middle, it comes out in a small glob and you use the broad area like a glue stick to spread it around. This is what I did for the Squirrel Card and my 2 cards from my "favorite die" post, I know those won't be coming apart! Hopefully it doesn't happen to you often, but this is a must have, especially for those thin fragile dies. Sometimes it helps to have a "color scheme" to get you started on a project, but if you ask me when it comes to making Autumn cards your colors are right outside your door, you already know the colors you want. But those of you who are not in the mood for fall cards yet, or it's not fall time for you this might help you get started. Here at home the colors haven't quite changed, but the changes popping up little by little, on all of our neighborhood trees. And as of today I'm packing my bags to leave on our favorite Autumn destination, across the river to Grafton IL, usually by this time the fall colors are in full bloom there, and the weather is perfect for hiking and biking and just relaxing at the Pere Marquette Lodge were we stay, chatting and playing games over a cup of cider or cocoa. When is a cloud not a cloud? When it's a tree of course :). I really loved the idea of using things in different ways. I guess it's a part of the whole repurpose, reuse, recycle & of course getting more bang for your buck. I love how this card turned out - so much better than I thought it would. I specifically made this as a guy's card. After die-cutting three sets of clouds I free hand cut out a trunk. I layered some "leaves" behind the trunk & added pop dots to the front ones, similar to the Pinterest pin. I then added the two leftover "leaves" to the base of the tree adding pop dots to one. I coloured the squirrel with Copics & inked the edges of the leaves & sentiment with Walnut Stain Distress Ink. I also embossed the background panel. Well I hope that I have inspired you to play along with us this month. I can't wait to see what else Hannah has in store for us all. below is the full set, but I will only be using the flower. and you can use the die by itself to create a cute little gift tag! The choices are endless! as with most dies. When you stamp flowers you usually want to use more then one color, so here are some tips on inking your flower. If you have small ink pads such as the 1 inch cubes, those work perfectly to get the look you want, its very easy to apply without getting messy or having to wipe off ink that got in the wrong place. Bigger ink pads are a little trickier, for example to ink the little stem in between the petals of the flower, you'll want to turn the pad at an angle using just a corner, if you still get ink on the edges just take a wet paper towel and with your fingernail wipe it clean before applying the next color. I myself am still trying to master the trick, as you can see above, but with the right touch it comes out perfect. Congratulations to Linda Palmer. You win the 4th and final week of our CELEBRATE challenge. Thank you for entering our challenge. This is your prize package! It is so much fun to use an entire stencil or only a portion. Easy to mask off what you don't want to use with removable tape. 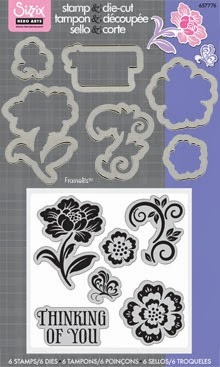 Be sure to visit Stencils with Style and view the information about how to handle the stencils from opening them to using them. Welcome to an all new challenge, I hope you enjoyed playing with Arlene last month! 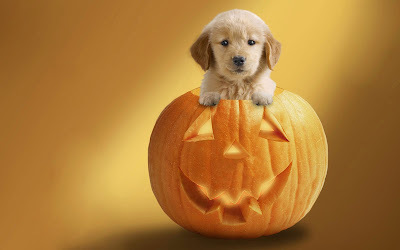 and have you ever seen the adorable pictures of puppies and pumpkins or in a pile of leaves! For example, this cute little guy! Make a fall card..... Or one with an animal on it (of any kind) either using a photo or stamp, Or... make a card combining the two options. 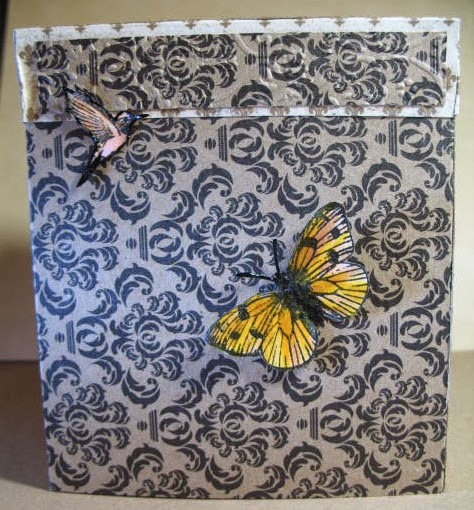 Just remember you must use at least one die cut or embossing folder on your project and if your new to our challenge rules, check out the contest rules tab above and have fun! Sponsoring us this month is Creative Play Stamps! If you have never heard of them you should check them out, its a great online retail store with great prices! I have found them to be very friendly and helpful, and they also have monthly newsletters and coupons, so head on over and sign up at www.creativeplaystamps.com and don't miss out, oh and I forgot to mention they ship very fast too! 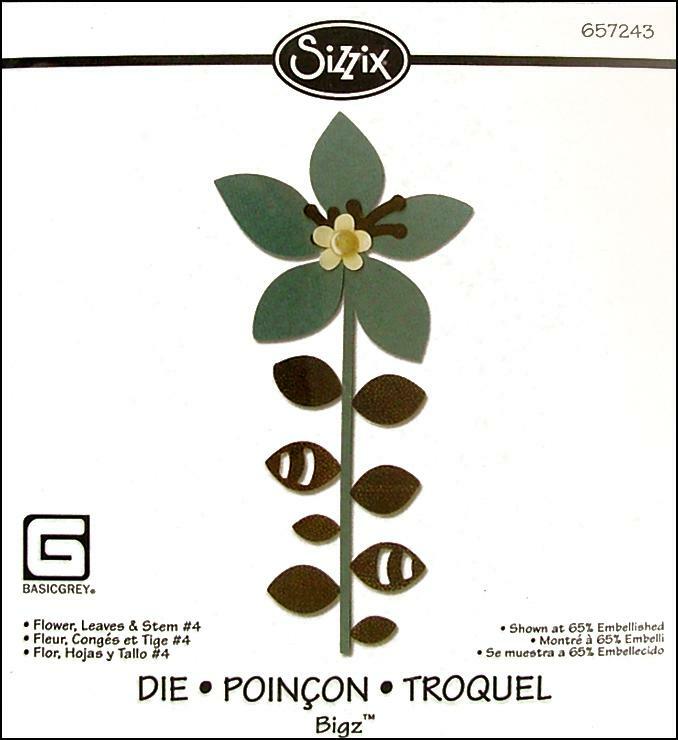 The Lucky winner will receive this cute Sizzix Bigz Die Flowers Leaves and Stems.